Propellers "of 3rd generation" : efficient, ultra-light, quiet and very strong. Made in France since 2008 : see page E-PROPS company. The secret of their exceptional performances ? - Extensive research of the E-PROPS design department, with many tests campaigns on wind tunnel et the development of an exceptional software called (LmPTR©). - A manufacturing process which allows a very lightweight. - Propellers with high ESR effect : ground adjustable pitch propellers which behaviour is very near from the behaviour of a variable pitch propeller. 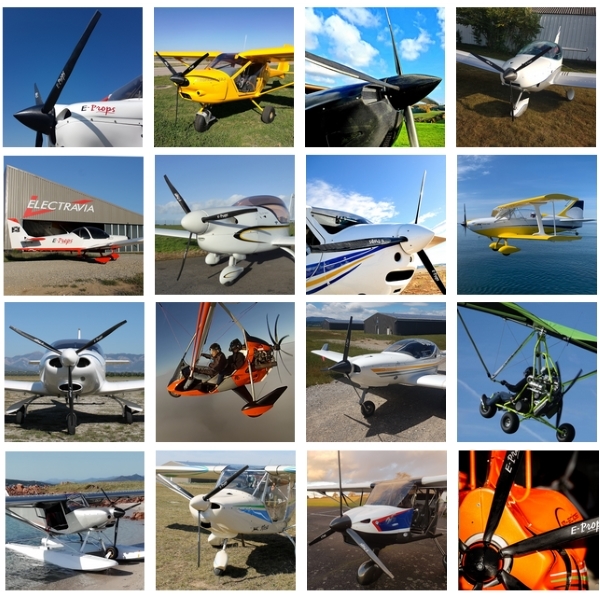 E-PROPS has developed many models for ROTAX serie 9 engines, tractor (DURANDAL range) and pusher (EXCALIBUR range). Thousands of those propellers equip more than 350 different models of ultralights and aircraft, all over the world. E-PROPS has not one “universal” blade, that can be cutted as necessary, and which are never very well adapted. 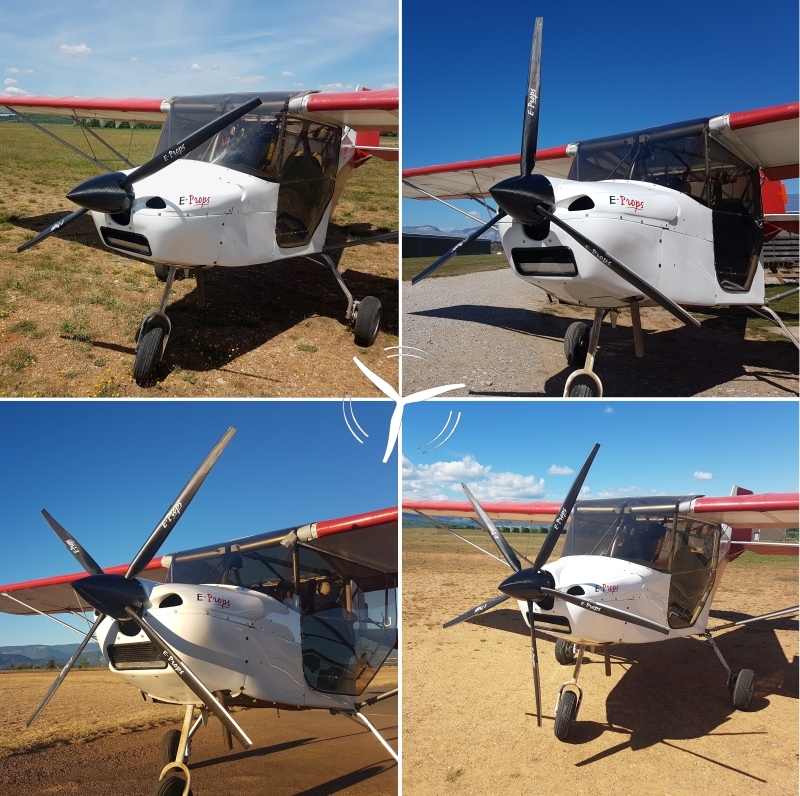 Every E-PROPS propeller is designed and tested for a specific engine, its reducer if any, the diameter, the speed range of the aircraft, the special configuration... All E-PROPS blades have different chords, diameters and profiles, and are produced by specific molds. E-PROPS proposes more than 185 blades geometries, and as result, exceptional performances for each set of aircraft / engine / propeller. The DURANDAL and EXCALIBUR ranges have been designed for engines with reducers. It is strictly forbidden to use them on a direct drive engine. A 3-blade diameter 170 cm ground adjustable pitch which weights only 2,6 kg ! E-PROPS are the world's lightest propellers. The E-PROPS are fully made in carbon. Optimum use of carbon fibers braid and epoxy resin to obtain ultra-light and very strong blades. HCF system (Helical Continuous Fibers : Fibres Continues Hélicoïdales), specifically designed by E-PROPS. Carbon fiber rolled up on a titanium ring, for an exceptional strength. No risk of galvanic corrosion because no metal part. The E-PROPS spinners are in carbon, very strong and very light. The carbon braid remains visible; each blade is unique. No paint, varnish or gel-coat, because those products are very polluting. The E-PROPS company is committed in an eco-management approach and proscribes this type of products. In addition, paints, varnish and gel-coat do not allow to easily repair the blades in case of impact. All E-PROPS have an internal shielding in the blades : injection at the leading edge of a special resin with Nanostrength® additive shock. In special cases (as seaplanes), it is strongly recommended to an extra protection on the blades leading edge, in order to reinforce it, with a polyurethane protection tape used on certified helicopter rotor blades. The E-PROPS, ultra-lightn, strictly respect the MOI limitations given the engines manufacturers. Moment of inertia of each model calculated then verified on the tests bench. The team is using an electronic bench to balance the propellers, with oscilloscopes. They are ASTM F2506-13 certified (lSA standards). No life limitation. MTBO recommended at 2.000 hours. Small impacts can be easily repaired (epoxy resin without paint, varnish or gel-coat). A repair kit is available in this e-shop. By E-PROPS, it is possible to change only one blade. E-PROPS is doing many tests on all the propellers models. Example, centrifugal load : break at 11.000 tonnes, safety coefficient : 7,2 Carbon propeller can hold 6 times the maximal load during 1 hour without any damages. Torque value is indicated in the Manual given with each propeller. It is very important to follow the value of each model. 2.600 RPM (measured at propeller = engine max RPM / reducer ratio.). - Before each flight: visual inspection of the propeller (particularly check the leading edge) and check the screws tightening. - Every 50 hours of flight and/or every 3 months : check of the screws tightening. - EXCALIBUR-6 model => every 25 hours of flight and/or every 3 months : check of the screws tightening. Cleaning of a carbon propeller is made with a sponge, with some water with soap, or with a product for windows cleaning. E-PROPS is the only propellers manufacturer in the world to propose a guarantee SATISFIED or YOUR MONEY BACK DURING 6 MONTHS to the customers. Our customers are our best ambassadors!